Rambling Mom: Win a year supply of bandaids! OK, all you mommies out there will love this contest by 5 Minutes for Mom. You can win a year supply of Nexcare Bandages (45 boxes!) from 3M simply by entering at 5M4M. 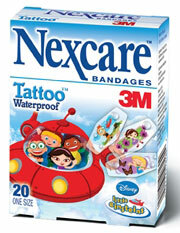 The unique design of these bandages is great for any cut, scrape, or boo-boo your little rugrat gets. I know my son is at the age where he gets a new scrape or bruise every day, and he'd love the "tattoo" ones with cartoon characters.